[0:00] <histo> citric: You may have trouble install xbmc on one of those. [0:00] <citric> histo, but will i need xbmc ? [0:11] <citric> histo, i dont need a usb powered hub for the android stick ? [3:21] <citric> I dont know what gpio is, ethernet doesn't matter to me, and video decoding. whats that for? [3:24] <citric> so is that better than playing videos? [3:25] <TLoFP> are there any parallel buses available on the raspberry pi? [3:25] <pksato> TLoFP: have a 17 bits pp port. [3:25] <shiftplusone> citric, if all you want is a device to consume entertainment, then the pi is definitely not for you. If, on the other hand, you want to learn about electronics and embedded systems or build something cool, that's where the pi is awesome. [3:27] <pksato> citric: that is cool for you? [3:28] <pksato> a telescope guided by rpi is cool for me. [3:28] <TLoFP> pksato: how would I implement this? how can I sychronize data output with the clock? [3:28] <shiftplusone> what did you search for? [3:28] <pksato> TLoFP: but, SPI is a serial bus. [3:40] <shiftplusone> pksato, so are you using it to control the mount and such? [3:40] <pksato> my tele in on box, and my rpi to. [3:41] <shiftplusone> ozzzy, what are you doing with that telescope exactly? [3:48] <citric> so wouldn't you rather use an arduino for something like that? if no, then why not? [3:51] <citric> why do you think that? [3:51] <citric> so a raspi is similar to a arduino except it runs an os ? [3:52] <na85> depends on your definition of "similar"
[3:53] <shiftplusone> and arduino is a prototyping platform. There is some overlap, but they're very different thing. [3:54] <citric> so what do you need to begin to program a reaspi? [3:54] <na85> it depends what you mean by "program"
[3:56] <shiftplusone> ccheney, noobs is an installer, it doesn't have sshd included. [3:56] <ccheney> i don't have a monitor with hdmi, only dvi. [3:57] <shiftplusone> ccheney, you can write your distro directly, without NOOBS. Raspbian and Arch both have ssh enabled by default. [3:57] <ccheney> so drop raspbian on there instead? [3:57] <shiftplusone> ccheney, are you using windows? [3:57] <shiftplusone> ccheney, use win32diskimage to write the disk image onto the card. [5:19] <Phosie> JakeSays: I could never work Fritzing for some reason, what would work physically, I couldn't do in Fritzing. [5:20] <Phosie> Probably just an error on my side though. [5:32] <Phosie> That's never good. [5:44] <appleguru> any ideas why my wifi speed on my rasbpi are crap (less than 1KB/s)? [7:22] <g2nightmare> okay well is there anybody here that can help me stream videos from my raspberry pi in raspbian? [9:03] <Bushmills> but running with the rockchip prozessors, which i would avoid, and prefer the Allwinner chips. [10:59] <gordonDrogon> so the moral is; don't buy cheap SDs .. ? [11:00] <steve_rox> the manufacturer is "dane-elec"
[11:31] <Tachyon`> how is using hardware exactly as designed making a car pc or a project at all? [11:32] <Tachyon`> the most complex part of that undertaking was flashing an SD card, a pi running XBMC is not a car pc, nor is it a project, it is using the hardware/software exactly as is while improving/adding nothing. [11:33] <SpeedEvil> but if other people thought as you, that would invalidate most of the patent lawyers! Oh the humanity! [14:26] <elsevero> ozzzy: ok, thank you anyway! [14:45] <Mothership> How to make autologin on raspberian wheezy? [14:48] <shiftplusone> Mothership, have you tried searching google for "Raspberry pi auto login" ? [15:04] <user82> hi. do i need to link anything special to use stdout in c++? [15:07] <shiftplusone> No, but you 'should' be using iostream instead. [15:07] <shiftplusone> especially if you want help in support channels like ##c++ if something goes wrong. [15:50] <Mothership> does rbp model a 256mb/ram consumes less power than model b? [15:54] <Bushmills> less RAM and less devices mean less power. [15:57] <ShadowJK> biggest difference is in the ethernet I think? [16:00] <Mothership> Also, ive read that there are versions of rbp that cant handle 3g usb modems and need external power source for them, but mine can handle. how can u tell without testing will it handle? [16:06] <Mothership> can i remove the ethernet in order to make it consume less power? [16:07] <shiftplusone> Mothership, if you a reflow station or a heat gun and are willing to risk permanent damage. [16:08] <Mothership> is it a huge risk? [16:08] <shiftplusone> it's not hard to do, but it's also not hard to do wrong. [16:09] <Mothership> so if i know a person who has experience at things like that i could let him do it right? [16:10] <shiftplusone> Mothership, you'll essentially making a 512MB Model A pi. [16:12] <shiftplusone> I haven't been following the conversation much, but why not use a powered hub? [16:13] <ShadowJK> Yeah that'd make more sense. [16:14] <gordonDrogon> afternoon pi peeps. [16:16] <gordonDrogon> what's the project? [16:19] <shiftplusone> How do you intend to turn it on automatically? [16:22] <shiftplusone> That crossed my mind as well. [16:22] <gordonDrogon> you could use an arduino to turn the Pi on & off. [16:23] <Mothership> isnt it steep learning curve? [16:23] <gordonDrogon> an atmega 328p has analog inputs and serial output to talk to a 3g modem if the weight sensor is serial the nyou can use a software serial code on the atmega. [16:24] <gordonDrogon> if you want to do it on the Pi though, you can turn off the USB hub - that halves the power I'm told. [16:24] * shiftplusone is a bit sceptical about that. [16:25] <shiftplusone> I heard that yesterday as well. Would like to test it. [16:25] <gordonDrogon> I'll need to measure it myself too. [16:25] <gordonDrogon> th epower off thing definately works - I just don't know how much I save. [16:26] <shiftplusone> I was always under the impression that there is nothing you can do in software to prevent the ethernet chip from using half of the power. In fact, Rob from the foundation said that. [16:26] <shiftplusone> So... go figure. [16:28] <gordonDrogon> I coudl test it now... would need to butcher a USB cable..
[16:29] <gordonDrogon> or I measure the voltage drop over the polyfuse - if I can.. let me check. [16:30] <Mothership> so additional 256mb dont really make much difference in power consumption? [16:31] <Mothership> and is there difference in boot time? [16:32] <shiftplusone> No, that depends on your OS and configuration. [16:35] <shiftplusone> Interesting way to measure power usage. [16:36] <gordonDrogon> so there is definate voltage drop, which implies a current drop too. [16:38] <shiftplusone> So that's what, 40% less power, assuming that's it's a linear relationship? [16:45] <gordonDrogon> I now have an ammeter in-line with a Pi. [16:46] <gordonDrogon> Somewhat jury rigged as I'm powering the Pi via the GPIO and a 7805, but I can measure the current..
[16:49] <shiftplusone> it uses the pwm pins and a filter to generate the audio, so it's very susceptible to noise, as I understand it. [16:51] <gordonDrogon> turn usb off and it's dropped to between .24 and 0.25, so a net saving of 130ma approx. [16:53] <gordonDrogon> so a 50Ah car battery is going to run for some time. Possibly a week. [16:53] <shiftplusone> gordonDrogon, does this disable the USB on the broadcom chip or just the hub chip? [16:53] <gordonDrogon> as far as I'm aware, just the hub chip. Ethernet goes down. [16:54] <gordonDrogon> and powered mice go off. [16:54] <shiftplusone> But you would expect that if it's the BCM chip as well. [16:55] <gordonDrogon> I was doing these tests for someone last week who asked us here to check it for him - he was seeing kernel panics - I ran it for a day in a loop every 10 seconds and didn't see a single panic. [16:56] <gordonDrogon> I see slightly different bahviour on a Rev 1 board though. [16:57] <gordonDrogon> On a Rev 2, the USB just "goes away" - as if all the peripherals got unplugged. On a Rev 1, they go offline, but don't appear unplugged. [16:57] <gordonDrogon> I put this down to the 3.3v wiring oopsie on the Rev 1 boards. [16:58] <gordonDrogon> still, this gives me hope for my garden Pi controller, fed off a pair of large batteries and a solar panel. [16:58] <shiftplusone> I think it's because on the Rev2 everything goes through the hub chip. So when usb is disabled, all devices attached to that chip disappear, as far as the bcm chip is concerned. [16:59] <gordonDrogon> the rev 1 had the 3.3v pin on the hub/ether chip conneced to the Pi's 3.3v supply - when it was supposed to be connected to a decoupling cap as it's generated internally to that chip. [17:00] <shiftplusone> So, does this work "echo 0x0 | sudo tee /sys/devices/platform/bcm2708_usb/buspower" ? [17:00] <gordonDrogon> I imagine so. [17:01] <gordonDrogon> 7805's running at about 50C, so that's obviously sucking some mw too. [18:08] <zproc> or is there a difference between guid / UUID? [18:41] <Renegade15> question: is it normal behavior that the pi reboots when I plug in a USB device? [18:44] <JakeSays> Renegade15: is it all devices? [18:45] <Renegade15> it seems that way...though I just noticed if I leave out the mouse/keyboard dongle, the wifi one lights up. Would being underpowered cause this? [18:48] <arrnas> anyone here use the xmbc along with a samsung tv? [18:48] <Phosie> Is it actually 1A? Sometimes the label isn't always the actual output. [18:52] <Phosie> If you are using a wifi dongle, 90% of the time you'll need a hub. [18:52] <Phosie> I can use one, but I can't have anything else plugged in. [18:53] <JakeSays> one of those 1cm'ers? [18:54] <Phosie> I'll be ordering a hub soon, £12 including delivery and a micro USB cable. [18:58] <Renegade15> is this purely a USB power issue, or do all plugs factor in? as in, would there be more power available if I unplugged ethernet or HDMI? [19:00] <davesleep> how do i put this arm asm soft on my pi directly? [19:00] <JakeSays> davesleep: soft what? [19:01] <Renegade15> have you checked point 7 of that page? [19:02] <Renegade15> which starts with "So we've written the code, now to get it onto the pi." [19:05] <nerdboy> well, it's been a well-known fact since i was a teenager that "dave's not here, man..."
[19:07] <davesleep> has anyone got any resources on this!? [19:08] <Phosie> did you downlod the template? [19:08] <Renegade15> "Open a terminal on your computer and change the current working directory to the parent directory of the source directory. Type make and then press enter. If any errors occur, please refer to the troubleshooting section. " [19:10] <Renegade15> davesleep, the idea is this: You write the code, compile it into a kernel.img, get an SD card with with an existing distro on it, and swap that's kernel.img for your newly created one. Then you boot off of the SD card. [19:10] <gordonDrogon> JakeSays, it should work - you may need to adjust the values of the resistors. [19:11] <Renegade15> davesleep if it's not as simple as described in the tutorial, are you sure your code is correct, the toolchain is installed and your build environment is properly set up? [19:12] <gordonDrogon> JakeSays, Pi has 3.3v output, Arduino has 5v output, so you might need to check the current required through the LED. [19:12] <Ricksl> what ya doing this time jake? [19:12] <gordonDrogon> JakeSays, and the detector is a bit weird - shame there isn't a schematic - trying to sketch it no..
[19:14] <gordonDrogon> JakeSays, the detector side is somewhat odd. [19:15] <JakeSays> gordonDrogon: well, so is the emitter/detector i bought from RS :( they have two versions under the same sku - one with a photodiode and one with a phototransistor. [19:16] <Ricksl> I did something like that, a light tripwire when I was a kiddo with my lego robotics thing, the old yellow brick one. [19:16] <JakeSays> gordonDrogon: heh. story of my life! [19:24] <Jck_true> Just remember the resister..
[19:32] <Phosie> Really wish I could drive a DC motor from the pi wihtout having to buy other things. [19:33] <Phosie> Just so I can control it with PWM. [19:33] <gordonDrogon> PiFace might be an easy way to do it too. [19:33] <Phosie> Ahh, I've just been looking at those kits. It's like £15 which I cannot justify. [19:34] <Phosie> I wouldn't get enough use from it. [19:34] <nerdboy> don't you already have +3.3 and +5 volt gpio pins? [19:34] <nerdboy> what are the motor specs? [19:34] <Phosie> nerdboy: It's the current that's the issue. [19:34] <gordonDrogon> Phosie, do you have a motor? [19:34] <Phosie> And I don't know much about the motor, 6v, salvaged from a RC car. [19:35] <gordonDrogon> Phosie, ok. it's very probably quite high current... so you would need a driver chip of some sorts..
[19:35] <gordonDrogon> Phosie, is there a Maplin near you? [19:35] <JakeSays> whats a maplin? [19:35] <Phosie> Probably one even closer, so yes. [19:36] <gordonDrogon> JakeSays, maplin is a UK chain of "electronics" shops ..
[19:36] <Phosie> I have everything but the chip, awesome. [19:37] <gordonDrogon> Phosie, the uln2803 will let you drive up to 500mA. [19:37] <SpeedEvil> JakeSays: Wait till the next budget. [19:37] <Phosie> I have a uln2003, would I be able to use that? [19:37] <gordonDrogon> yes. that's 7 IO's the 2803 is 8. [19:38] <Phosie> I'm all sorted then, thanks. [19:38] <gordonDrogon> but make sure the motor isn't going to draw more than 500mA. [19:40] <TLoFP> how close can I get to 100 Mbit/s transfer with the ethernet on the RPi? Has anybody done any throughput tests? [19:42] <gordonDrogon> iperf will give you about 95Mb/sec each way. [19:44] <gordonDrogon> not as fun though. [19:44] <gordonDrogon> and you'll need a good wirewound pot. [19:44] <Phosie> Pi it is then. [19:44] <gordonDrogon> do you have a multimeter? [19:45] <gordonDrogon> well... if you connect it to the Pi via a uln chip then what's the worst that can happen - you'll overheat the uln chip..
[19:45] <SpeedEvil> gordonDrogon: you connect the chip backwards, and kill the pi. [19:45] <gordonDrogon> yea - the one I have was about a fiver - 15 years ago. [19:45] <TLoFP> gordonDrogon: any idea how much data you can push over GPIO ? [19:46] <Phosie> I don't want to take any risks so I might just leave the idea. [19:46] <timmmaaaayyy> i'm trying to get the pi to start taking pictures immediately when it's plugged in. i added "raspistill -o img%04d.jpg -tl 10000 -t 21600000" to /etc/rc.local, but it doesn't start taking pictures when it boots up. any ideas? [19:46] <Phosie> SpeedEvil: £6,271.44, Bargin! [19:47] <gordonDrogon> TLoFP, not a chance at that data rate - unless it's coming in on a camera interface and being processed by the gpu. [19:47] <gildean> my multimeter cost a little bit more, but it's a sanwa and actually says "made in japan"
[19:47] <Ricksl> don't see why it wouldn't be. [19:47] <gordonDrogon> JakeSays, er, probably, but the Pi doesn't have an analog input. [19:48] <Ricksl> there is that though, that is a photoresistor right? [19:48] <gordonDrogon> yes, photoresistor - LDR ..
[19:48] <gordonDrogon> JakeSays, yes, you can do that. [19:49] <JakeSays> LDR - light detecting resistor? [19:49] <gordonDrogon> that circuit isn't really the best for a 1-bit A/D though. [19:49] <gordonDrogon> in bright light (low R) it might never reach logic 1. [19:50] <gordonDrogon> with the + going via a 100R to he gpio pin. [19:51] <gordonDrogon> you set it to output and low. wait. Then set it to input and wait for it to become logic 1. [19:51] <gordonDrogon> you time that last period. [19:51] <JakeSays> is .01uf a good value for the cap? 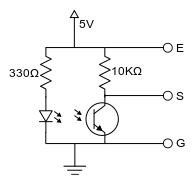 [19:53] <Ricksl> I am pretty sure the cap is used to eliminate small fluctuations in the photoresistor. [19:53] <gordonDrogon> probably to soak-up a 50/60Hz light flicker. [19:54] <gordonDrogon> JakeSays, you ought to work these things out, but start with the .01 and see if you can write a program that times it accurately. [19:55] <Phosie> Ugh can't find my solder. [19:55] <gordonDrogon> you also need to look up the voltage that the Pi will think is a logic 1. [19:56] <gordonDrogon> however that will vary from pin to pin and Pi to Pi - but not by much. [20:00] <JakeSays> ormally the voltage threshold is about 1.8V, but it isn't guaranteed; it can be anywhere between the maximum input low and minimum input high, that is, between about 0.8 and 2.0V. [20:01] <JakeSays> Normally the voltage threshold is about 1.8V, but it isn't guaranteed; it can be anywhere between the maximum input low and minimum input high, that is, between about 0.8 and 2.0V. [20:01] <Schonert> any news/rumors of a model c ( rev 3 ) ? [20:03] <JakeSays> Schonert: yes, unfortunately i have no idea which tuesday. [20:08] <shiftplusone> Schonert, revisions and models are not the same thing. Rev 3 would only be minor hardware fixes for things you wouldn't notice. [20:08] <shiftplusone> A model c is not on the horizon at all. Maybe in a few years. [20:09] <shiftplusone> If you need something else, there are cubieboards and similar. [20:10] <JakeSays> shiftplusone: so far i'm using about 2% of my existing pi. [20:12] <gordonDrogon> from the Rev 1 ro the rev 2. The I2C pins moved and pin 22 became pin 27. [20:17] <Phosie> I love my Rev 1, just wish I had more RAM. [20:17] <JakeSays> huh. apparently you can power the pi using p1 instead of the micro usb connector. [20:18] <gordonDrogon> just make sure it's a regulated 5v supply. [20:18] <gordonDrogon> enough to melt the PCB tracks. [20:19] <gordonDrogon> so powering the USB peripherals externally is still a VERY good idea. [20:19] <JakeSays> gordonDrogon: any idea how much that would be? [20:19] <gordonDrogon> JakeSays, I won't speculate, but personally I wouldn't like to draw more than 150mA from each one. [20:20] <JakeSays> gordonDrogon: yeah. i dont intend to try. just curious. [20:20] <shiftplusone> JakeSays, I've asked someone from the foundation and he didn't know off the top of his head, so I think anything anyone said would only be a rough estimate. I beleive Eben has said they can handle the load of the pi + 500mA load on each usb port, but I wouldn't trust that too much. [20:23] <shiftplusone> There is a formula you can use based on the track width, length and thickness, so if you can figure out those values, you might be able to figure it out. [20:23] <gordonDrogon> knowing that they said that it was a struggle to get the PCB to 6 layers I'd not like to push anything personally. [20:24] <gordonDrogon> You could (and I've seen it) run separate wires from the �USB input directly to the USB ports - with a big buffer capacitor. [20:25] <gordonDrogon> ah, not seen that one. [20:25] <gordonDrogon> I'd still put a big capacitor at the entry point of the power. [20:41] <shiftplusone> the recovery thing? [20:46] <Ricksl> I have like 3 rev 1 but no rev two, i need a new one. [20:47] <ashleyw> Hey I've got two Pis and two sdcards, yet both of them stall when booting Xbian (also raspbmc)…with HDMI in, there is only PWR, no OK/ACT light. Without HDMI, the OK light flashes. I've installed this dozens of times, so I'm stumped as to why it's happening on both of them? [20:50] * shiftplusone shrugs and fires up dungeon keeper. [20:53] <JakeSays> shiftplusone: so you can't hotplug usb devices? [20:55] <shiftplusone> I know it's not in line with specifications, but is it really a problem? [20:57] <gordonDrogon> shiftplusone, wish I could play DK again... no Win PC. [20:57] <gordonDrogon> shiftplusone, and it runs OK in it? [20:57] <gordonDrogon> shiftplusone, oh. well, that's me week gone then. [20:58] <gordonDrogon> Joshun, you can use the gpio command to export the pins you need to use, then call wiringPiSetupSys () and you can access gpio as non-root. [20:58] <gordonDrogon> shiftplusone, I have original CDs. [20:58] <Joshun> gordonDrogon - is there a function for that or do you have to do a system("cmd") ? [20:59] <gordonDrogon> Joshun, you can use system, or put the gpio commands in a script before you run your program. [20:59] <gordonDrogon> does dosbox run on the Pi ? [21:01] <shiftplusone> urbanonymous, what are you using to record and what is your question? [21:04] <urbanonymous> I read that sox -> pysox, can analyse and rec . [21:04] <shiftplusone> A google search returns plenty of decent results, but you can also try asking in #python (or is it ##python? ), since this isn't a very pi-specific question. [21:06] <shiftplusone> Have you had aa look at this http://docs.python.org/2/library/ossaudiodev.html ? [21:07] <shiftplusone> Well, I am not sure how 'accelerated' dosbox is. I have seen people say it's not faster than running qemu with dos installed, though I doubt that. [21:08] <shiftplusone> Ricksl, have you tried ScummVM, I think return to zork is supported and that's pretty much running native. [21:09] <ashleyw> Okay, so with Raspbian, a new HDMI cable and monitor, and hdmi_safe=1…ACT is still flashing? A bit of googling indicates it could be something to do with the 'polyfuse' and that I just need to leave it turned off for a while...could it be? [21:09] <shiftplusone> Ricksl, I have just checked, return to zork is supported by scummvm, so you should be able to run it just fine. [21:11] <shiftplusone> ashleyw, do you have a multimeter handy? [21:12] <shiftplusone> Ricksl, originally, yeah, but they have expanded beyond scumm games to adventure games, as I understand it. [21:12] <Ricksl> so how does it work, processor emulation or what? [21:14] <shiftplusone> I think it's pretty much re-implementing the engine and uses the data files, so it's like running native, but I may be wrong. [21:18] <shiftplusone> Did you update apt? [21:22] <JakeSays> shiftplusone: much better:) thanks! [21:23] <shiftplusone> You should do that before installing anything, really. [21:29] <zerkman> anyone here with experience on openGL on the Pi ? [21:39] <Ricksl> people have had fun building clusters with them though. [21:39] <zerkman> did thay actually use them ? [21:39] <Phosie> I still love that nickname for them. [21:40] <Ricksl> but whenever people do they always get bashed saying "for the cost you put into that you could have made a more powerful single computer"
[21:41] <Ricksl> thats kinda a tough question since there is no one answer. [21:42] <lwizardl> The current idea is pi, laptop hdd, hdd to usb adapter, usb media reader, and desktop dvd-rom drive. [21:42] <Ricksl> alright so you might want to do something like this. [21:43] <Phosie> I'll be going down the hub route, but I won't be powering much either. [21:45] <Ricksl> because if it has its own power source you will want to plug it into the pi usb directly to eliminate having to go through the hub, since when it goes through the hub it will slow down a bit. [21:47] <Ricksl> what kind of issues do you run into? [21:49] <Ricksl> shiftplusone: do you think anything bad would come from backpowering the pi using a usb Y cable? [21:50] <shiftplusone> I don't think so, but I am not too careful about these things. [21:51] <Phosie> I'm strangely excited about having 2A to play with. [21:51] <Ricksl> so if you plug the dead side of the usb y (the side that supplies just power) into a usb power port and the data side into a pi you will turn on your pi using that. [21:53] <Ricksl> well see I am not sure of the best way of powering everything. [22:02] <Ricksl> so if you want to make sure no backfeeding happens, somewhere between the hub and the pi usb you will need a diode. [22:02] <shiftplusone> Why are people worried about backfeeding? [22:03] <shiftplusone> That would depend on the power supply the hub is using rather than the hub itself, wouldn' it? [22:11] <Ricksl> this is something along the lines of how I would do it. [22:14] <Ricksl> I just threw this together with what I had on my workbench. [22:17] <shiftplusone> because any more than that would be silly, 'course. [22:23] <Ricksl> isn't cellular in europe pretty much monopolized by vodaphone? [22:24] <dangerarea> thanks, I even skimmed the motd! [22:24] <linuxstb> Ricksl: Not really. IIUC, each country has several competing physical networks. But yes, vodafone are one of those in most countries I think. [22:34] <linuxstb> dangerarea: So how well is your system working? What bitrate is your audio stream? [22:34] <DaQatz> Ricksl: What part? [22:38] <DaQatz> I used to make the same mistake a lot. [22:52] <JakeSays> hmm. so with class 10 sd cards you can't overclock? [23:14] <heckman> Has anyone had any luck installing Debian 7.0 wheezy on an SD card using debootstrap? [23:46] <JakeSays> zproc: huh. i'll give it a try then. [23:46] <shiftplusone> JakeSays, where did you get the idea that you can't? [23:48] <JakeSays> "If you use Class 6 & 10 SD Cards and want an stable running PI : DON´t try Overclocking or you Losing probably DATA "
[23:51] <shiftplusone> Given the formatting of that section, it seems like somebody went all derpy on the page. [23:54] <shiftplusone> Nuh, I don't seem him typing " you Losing probably DATA"
[23:55] <taza> Yeah, that's nonsense. [23:56] <taza> Overvolting increases risk of data loss, at a point. Probably faster SD cards may be problematic too.